Will Machines Ever Think Like Humans? Gérard I think that machines will be better than human beings in various fields : perfect memory, fast computation for instance. Nevertheless they will never be human. A tree for instance will never be an animal. it's different ! Muriel, Neither Alan nor I said "be human" but "think like humans", didn't we? 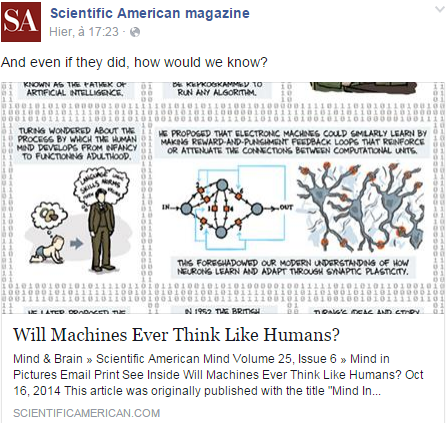 Gérard how can a machine think like a human being ? Thought and emotion are mixed aren't they ? I wonder if machines will ever feel, have emotional intelligence, empathy ? I don't know about the details of the machine algorithms but the criterium for Turing was that if a human couldn't detect they had a machine in front of them, then we could say the machine is thinking like humans. Nowadays' robots can address emotions. As consumers buy more from the Internet's largest retailer, it keeps up by outfitting warehouses with robots that work at a speeds humans can't. "We don't socialize as much, but it's more efficient,"
The problem is that people don't interact as much with one another but the work is easier. This medical centre has the largest fleet of automated robots in the US. A new state-of-the-art medical center is just weeks away from opening its doors in San Francisco. At this high tech-hospital, working alongside the doctors and nurses is the largest fleet of automated robots in the country. loads and travelling long distances. Rapidly getting tissue samples or blood samples from a point A to a point B is very useful because they never stop for a coffee or a chat. What is a human being ? Is there an aspect which gets away from us ? Soul ? spirit ? Is it possible to get a certain relationship with a robot ? Can we love a robot ? WHY YOU SHOULDN'T FEAR ARTIFICIAL INTELLIGENCE: Stephen Hawking and Elon Musk have warned us of the dangers of Artificial Intelligence, but is AI really going to be the downfall of humanity? Thanks Gérard for that very comforting video. I don't distrust artificial intelligence whatsoever. The benefits for humanity will be huge and will make the world safer, I am sure ! Artificial intelligence does not have consciousness, it's just programmable ! It's not scary ! After Gates' comments, Stanford Uni asks for an Ethical Committee regarding Artificial Intelligence. As don't know much about robots I Wonder how they could be dangerous. I have read that among all forms of technology that could wipe out the human species artificial intelligence is number one risk for this century. Do programmers have to be careful then ? an Ethical Committee regarding Artificial Intelligence. The Ethical committee is for the programmer, not for the Artificial intelligence. > The Ethical committee is for the programmer, not for the Artificial intelligence. Everything that is possible for a computer/robot/machine has to be written by a programmer (and designed by a designer)..
With robots becoming increasingly powerful, intelligent and autonomous, a scientist at Rensselaer Polytechnic Institute says it's time to start making sure they know the difference between good and evil. "I'm worried about both whether it's people making machines do evil things or the machines doing evil things on their own," said Selmer Bringsjord, professor of cognitive science, computer science and logic and philosophy at RPI in Troy, N.Y. "The more powerful the robot is, the higher the stakes are. If robots in the future have autonomy..., that's a recipe for disaster. Gérard i understand perfectly. Anyway when I read articles on the subject I feel that man creates another species : The robots. L'Intelligence Artificielle, dernière action de l'humanité ? On a beaucoup parlé, récemment, de personnes connues (Stephen Hawking, Elon Musk, Bill Gates, etc.) mettant en garde contre le développement d'une intelligente artificielle qui pourrait s'auto-développer, et remplacer l'humanité. Je connais bien les propos de tous ces néo-azimoviens. Ma différent se situe au niveau des termes "remplacer l'humanité". Une IA ayant atteint la singularité (ayant divergé) n'aura aucune raison de se préoccuper de l'espèce humaine. Elle l'ignorera, tout simplement. Il n'y a aucun motif logique pour que l'IA perde du temps et gaspille des ressources à traiter l'humanité. Le plus gros problème, AMHA, est le risque de névrose collective d'une humanité s'étant auto-démontré sa propre limite évolutive. Une autre hypothèse, c'est que l'IA, une fois atteinte l'asymptote de son évolution ontologique, soit confrontée à une absence de but à cause de son immortalité, et ne s'accomplisse plus que dans un suicide. En bref je n'ai pas compris. Pourtant le sujet est fort intéressant. We really do let our robot creations loose at our own peril. Technically Incorrect: Don't sleep on your apartment floor. Your robot vacuum cleaner might mistake you for dirt, as one Korean woman found. From the blogs: Scientists debate whether AI is dangerous and what ethical questions the creation of AI may pose. The gentle giant has been designed specifically to assist in caring for Japan's ageing population, taking on heavy-duty tasks such as lifting. Yes Gérard we agree to have a teddy - bear-faced robot for our old age, that's a good idea ! Marvellous ! He's Edouard Bear's son, isn't he ? Wouldn't you prefer a true nurse?? Indeed, I'd prefer a true nurse !